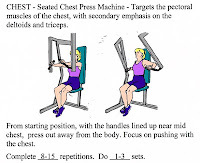 Machine Used-Chest Press: I did 2@10 and 1@30. The fact there is no 20lb weight on this machine annoys me, I admit it. The 10lb feels pretty easy, but the 30lb tends to feel trying. It does depend on if I’ve been doing other activities, though. Despite this, I will increase to 2 sets of 30 at my next setting; I will just have to work my way through this. Machine Used-Fixed Pulldown (15lb. Increments): I did 1@40, 1@55, and 1@70. I even experimented with 85lbs of resistance and was able to pull off half a set. Next time, I will phase out the 40 to increase my endurance at 55lb weights. 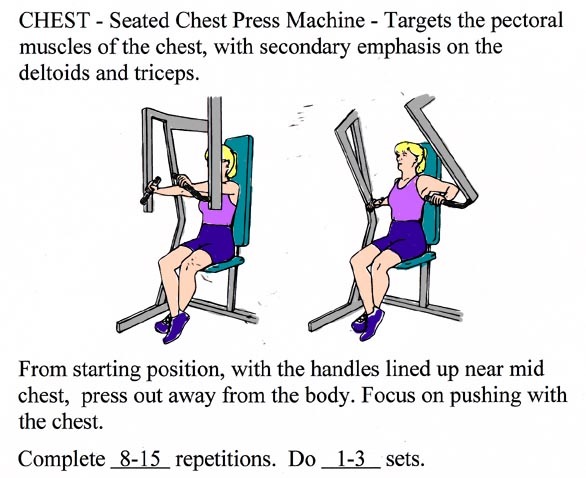 Machine Used-Rear Deltoid: I implemented the 2@30 and 1@50. Progression was successful. I will stay on this setting to increase my endurance at the 50lb weights. Machine Used-Arm Curl (bar): I was on a different machine which utilized 10lb. increments and was able to do 1@30, 1@40, and 1@50. I am debating phasing out the 30lb weights and doing 2@40 and 1@50, if I’m able to get on this same machine again. Machine Used-Arm Press: I did 3 sets of 12: 1@90, 1@110, and 1@130. The 130lb really makes one feel the burn. I will stay put for right now. Hip Adductor: I did 3 sets of 12: 2@90 and 1@110. I may phase in the 130lb, since I was able to do another experimental set this round. Rotary Calf: I did 3 sets of 12: 1@50, 1@70, and 1@90. I experimented with 1 set at 110lb weights and felt slight strain. I’m not sure if I’m ready to bump up to 110lb, but I know I’m ready to start phasing out the 50lb weights. Leg Press: I was able to do 3 sets: 1@70, 1@90, and 1@110. I have to start building up my endurance on this one, which will occur when I do this exercise more often. Lower Back Extension: I did 3 sets of 12: 1@70, 1@90, and 1@110. I will try this setting for another week and then begin to phase out the 70lb. Weights. Although I was able to do 1 set @130(I experimented with that in Progress Report 11), I’m not quite ready to incorporate it until I build up my endurance to the 90lb weights. Ab Crunch (upright): I did 2@30 and 1@50. Next week, I’m going to increase the number of reps on the 50lb weights. Ab Coaster: 3 sets of 15 with 25lbs. resistance. Side Note: I do not mess with the weights on the Ab Coaster machines simply because I don’t quite know how to do it, although I’m sure it’s relatively easy. I just go on the one which is available, and I try to go on the one which has the most weight so the effect will be maximized. That is why sometimes, one may see 10lbs of resistance and other times, 40lbs. Bile: I increased my amount of time on the bike from 12 minutes last session to 13 minutes this session. Counting the 3 minutes for cooldown, it brings my total to 16 minutes. Elliptical: I increased my time on the machine from 7.5 minutes to 8 minutes. Adding in the two minutes for cool down, brings it to a total of 10 minutes. Treadmill: I adopted a different strategy for Treadmill this time around. Normally, I would put it on Quick Start, but this time, I tried two settings. The first setting was a Fit Test. I did a 5 minute warmup with speed of 2.8mph. I was able to work through it, which I thought was an accomplishment. The second thing I did was play around with the Personal Trainer-Fat Burn Test. I set a goal to get my heart rate to 140 bpm at the speed of 3.0mph. I opted to work out for approximately 10 minutes and anything extra would be a bonus. The incline got up to 8.3, which felt pretty intense for me. I got up to about 11 minutes, and with 5 minutes for cooldown, totaled 16 minutes. It’s definitely a start, and considering where my endurance was for any of the machines when I first started, I am making wonderful strides. On a day like this, the Hydromassage bed was definitely a blessing. I admire your tenacity where your workout is concerned. While I will exercise regularly, through walking, I rarely lift weights. This sounds fairly detailed and pretty comprehensive, good luck on your exercise journey. Thanks for your support, Reggie!